My enthusisam for gardening is temporarily on the decline. 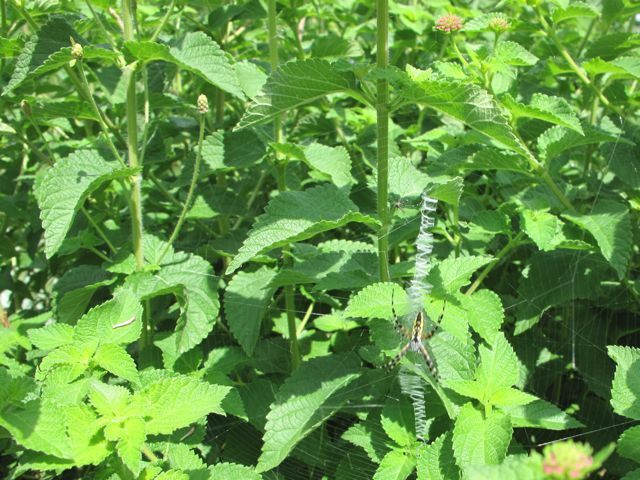 Mosquitos are aggressive, as are weeds and grass in the garden after a rainy spring and summer. After weeks of daily rain storms a break from precipitation during the past three days brought welcome sunshine and blue sky, albeit with extreme heat and humidity. It is an understatement to say spending time in the garden certainly is less compelling now than during those first warm weeks of spring when everything was fresh and young. I know dedicating even a few hours would benefit the overall appearance of the borders and help sustain the progress made to date in battling the Spiderwort, but procrastination is winning again today. Maybe tomorrow the call will come. Despite my inattention the garden looks stronger than usual at this time of year. 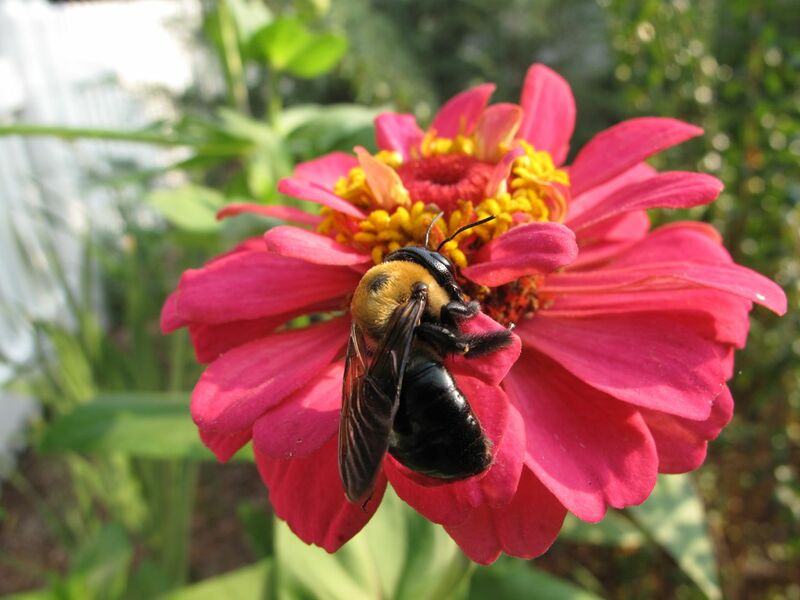 Pollinators are finding plenty of attractions. 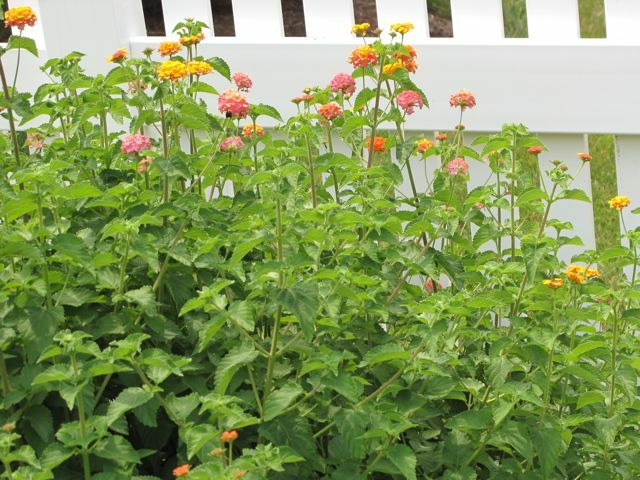 A few self-seeded Zinnias add extra color to the Western border. Also self-seeded, Cleome abound. 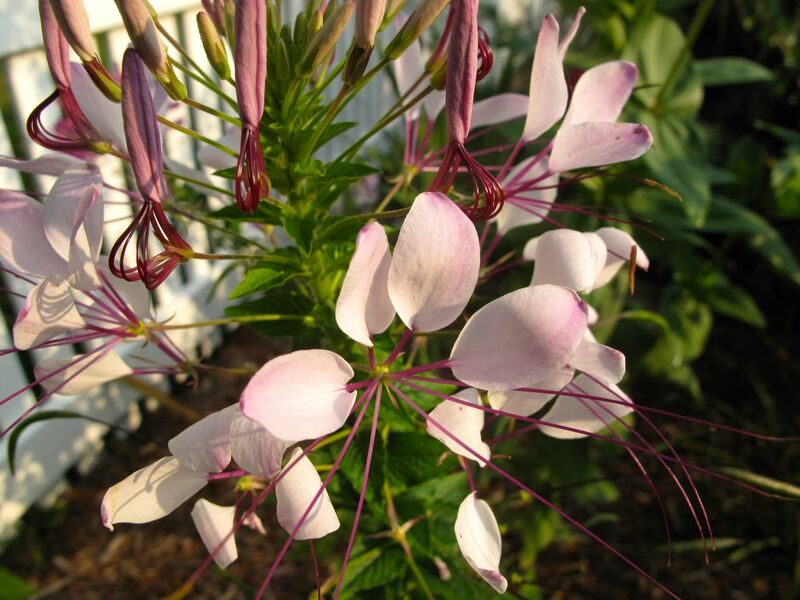 It is easy to see how the common name of Spider Flower originated. The complex structure of their flowers is fascinating. Yellow rays and green disks of Rudbeckia hirta ‘Irish Eyes’ brighten the southern entrance to the garden. 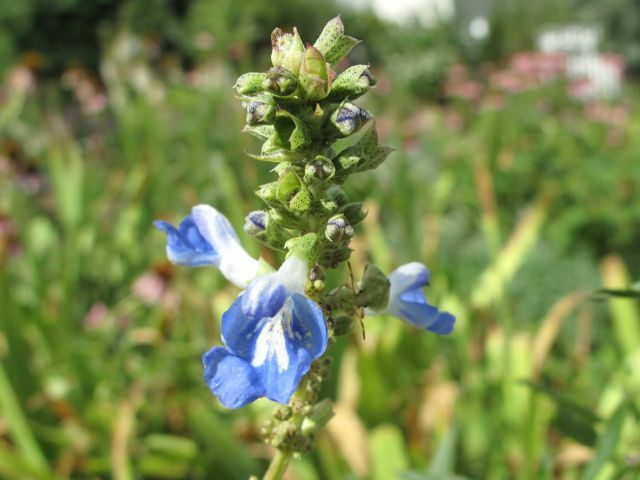 Recently more bees are arriving to enjoy them, equipping this plant with its own buzzing, humming soundtrack. 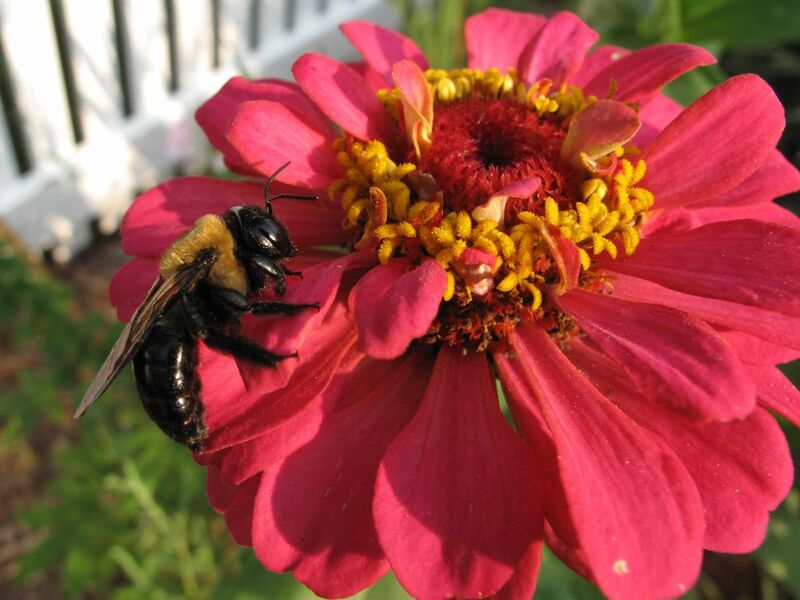 This entry was posted in garden and tagged Cleome hassleriana, nat, pollinators, rudbeckia hirta, zinnia on July 19, 2013 by pbmgarden. 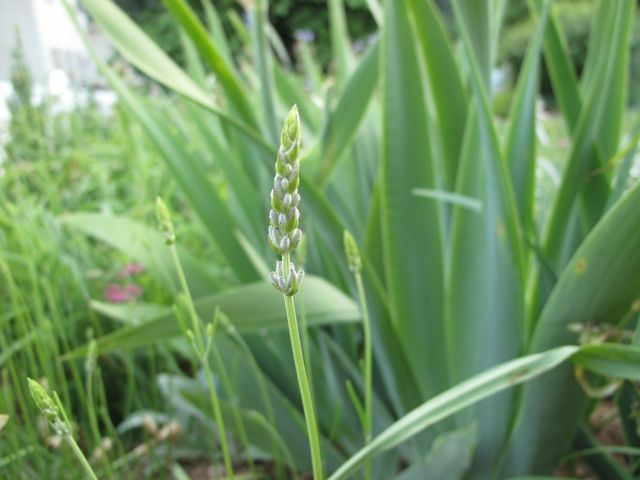 Gone is the lush, verdant freshness that characterized the garden in spring. Summer has arrived. High temperatures and lack of rainfall are taking a toll on the garden’s charm and beauty as many plants begin to dry and yellow. The grass is browning quickly. Though the garden has peaked for this year, there remain a few spots of interest. One such spot is a borrowed view: a neighbor’s striking row of sunflowers add a happy whimsy. 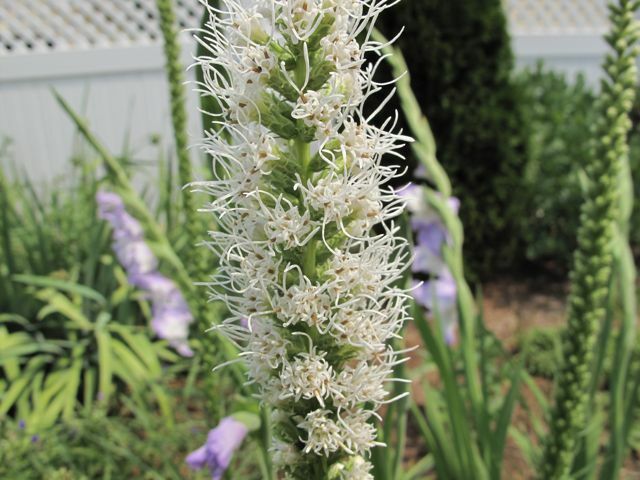 Closer to home, spikes of Liatris Spicata ‘Alba’ contribute interesting texture and plantings of Shasta Daisy, Monarda, and Echinacea add drifts of color, but the garden definitely is losing its overall cohesiveness. 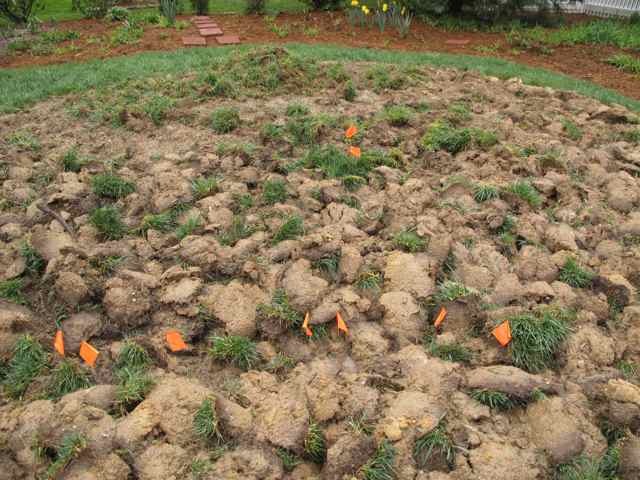 Part of this year’s garden renovation is to evaluate the garden in every stage, through every transition, and to decide how to improve the plantings, extend the blooming period. 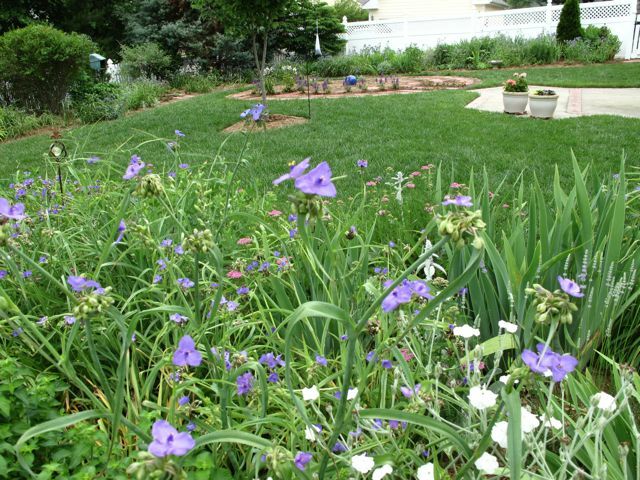 Finding success in redesign will allow the garden graceful ways to peak, rest, and recover throughout each season. 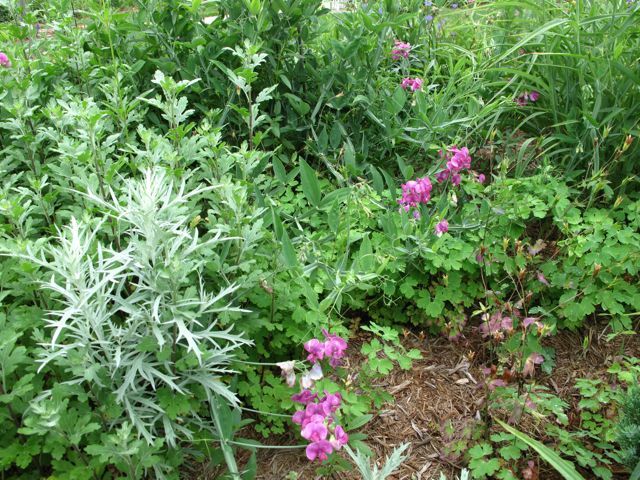 In the meditation circle Angelonia angustifolia (summer snapdragon) provides dramatic color, especially the Angelface® Blue. Ten more angelonia, purchased at a great sale price from Southern States, were added to the labyrinth last Friday. 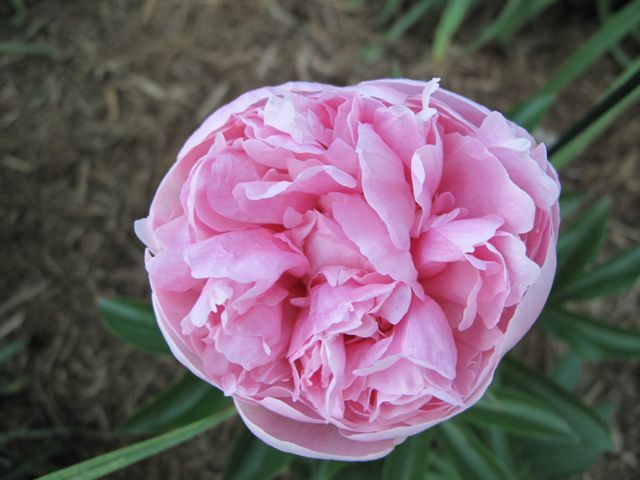 They are a lighter shade, Wedgwood Blue, but should contribute blooms until the first frost. 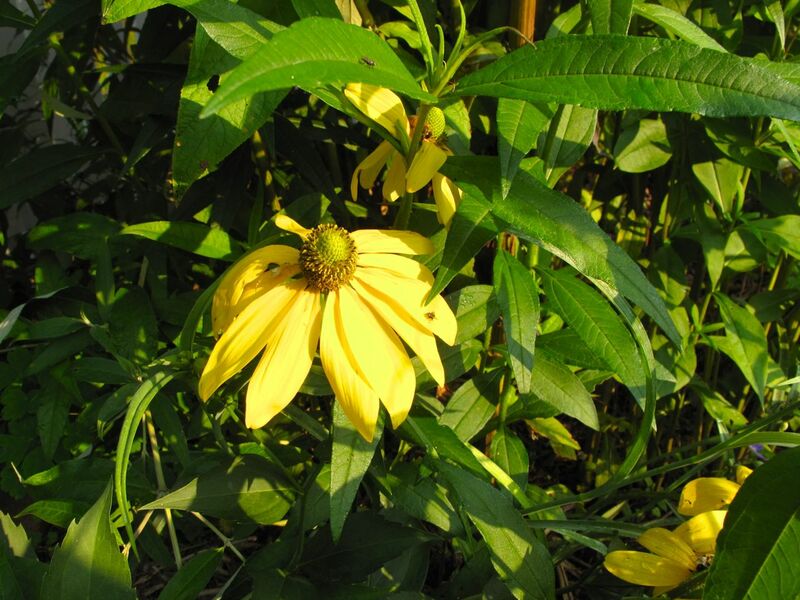 The Rudbeckia Hirta ‘Irish Eyes’ has formed buds and will soon add some bright yellow at the back of the west border. 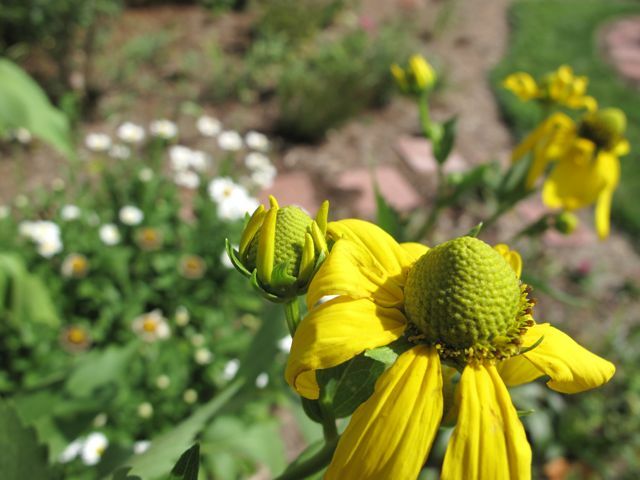 This entry was posted in garden and tagged echinacea, garden renovation, liatris, meditation garden, meditation path, monarda, rudbeckia hirta, shasta daisy on June 26, 2011 by pbmgarden. In early spring first the lenten roses, then the daffodils and spirea dominated the garden. 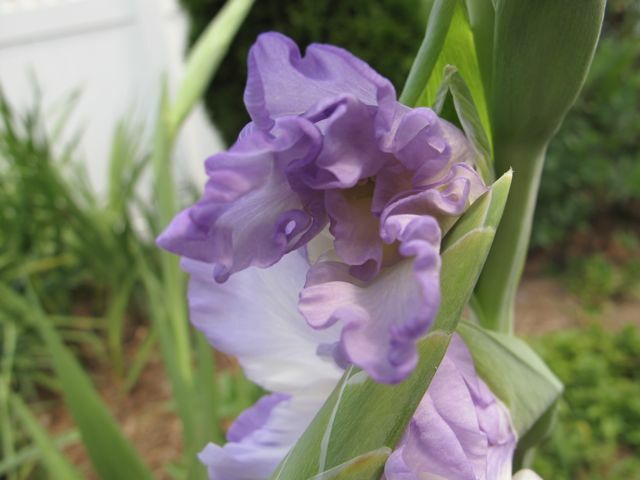 By mid-April the first bearded iris had opened. 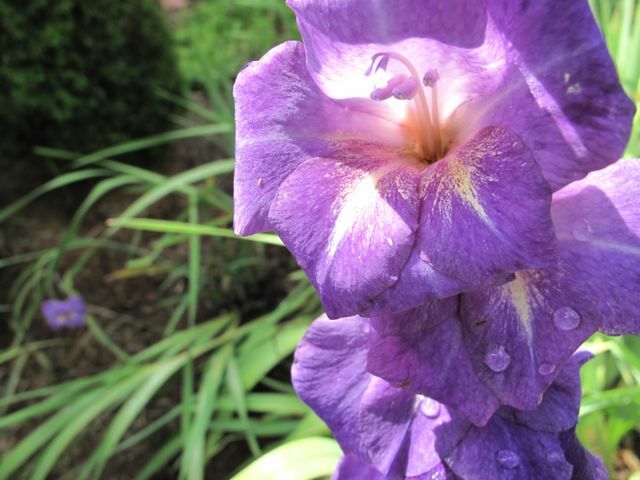 Now, three and a half weeks later, a few irises, along with the old-fashioned rose and the clematises, remain in bloom. Take a quiet stroll around the perennial beds and it is easy to notice the garden again is in transition. 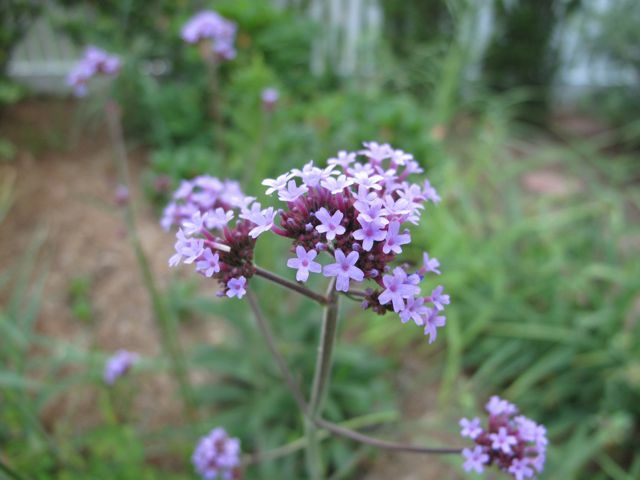 A verbena bonariensis is blooming and echinacea (purple coneflower) are beginning to open. Several foxgloves are forming their complex flowers. 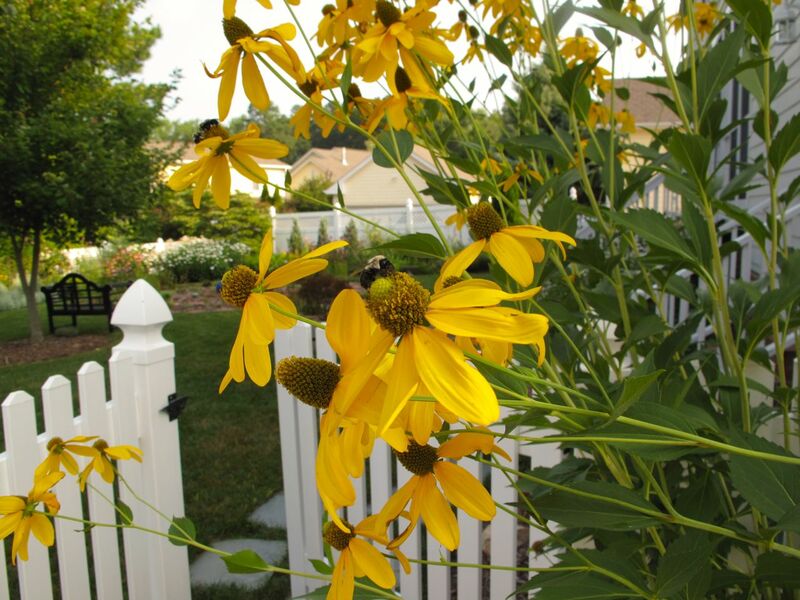 Nearby an ‘Irish eyes’ rudbeckia already has reached two of its expected five feet. 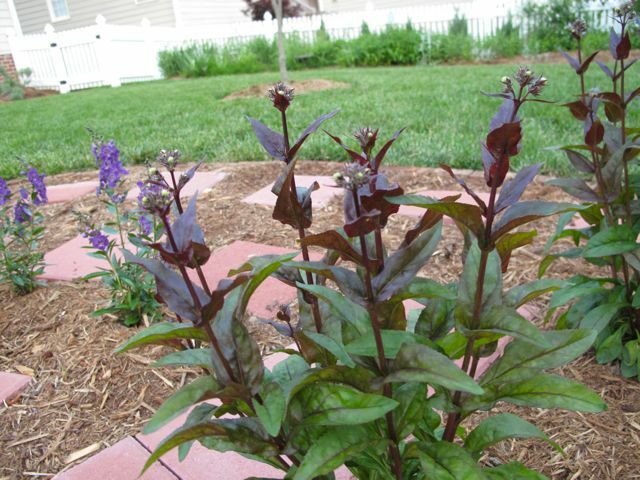 The monarda (bee balm) also is tall and seems primed for a big display of red and fragrance. 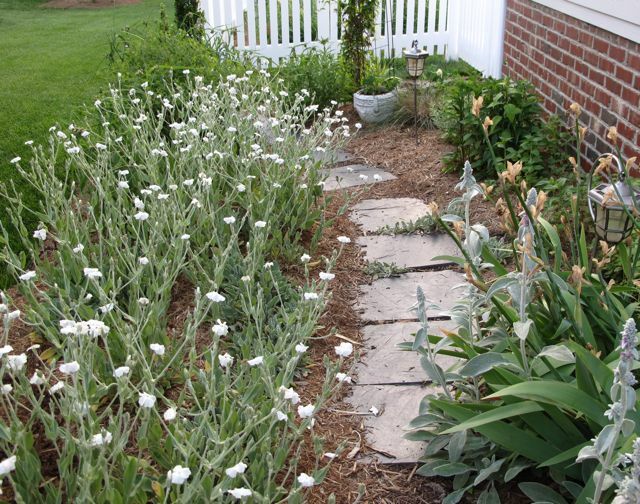 A soft gray mound of artemisia accents the border and a perennial Dusty miller is creeping through the garden. Asclepias tuberosa (Butterfly Weed) will soon add its bright reddish-orange color to the blue palette that has predominated the garden in early spring. The very tips of the white tubular flowers of Penstemon digitalis ‘Husker Red’ (Beardtongue) are becoming visible. These two penstemon are planted inside the meditation path forming a wall at one of the turnaround points. 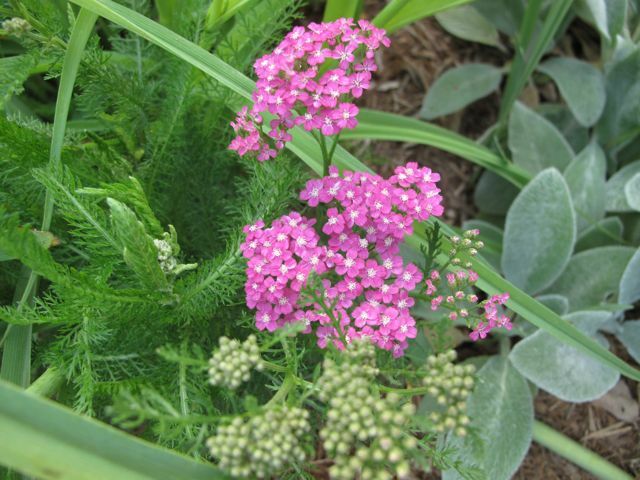 One of the small pink yarrow is just beginning to open among the lamb’s ears. 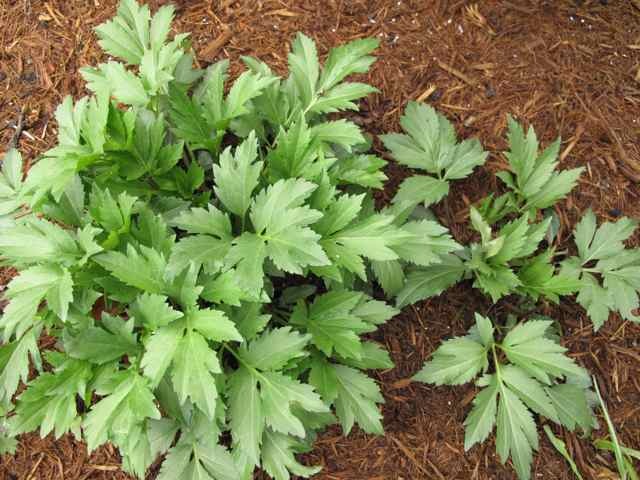 Rising only 10-15 inches, it has a lacy flower and a dark green, feathery-soft foliage. 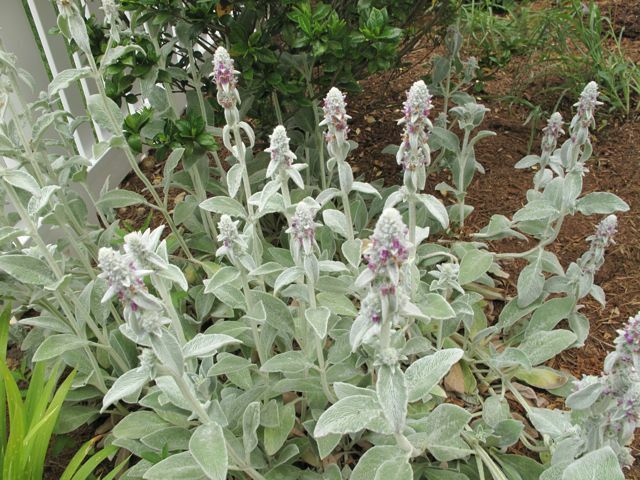 Lavender will soon be adding its beautiful color and unique fragrance to several locations. The lavenders responded positively to severe pruning in February. 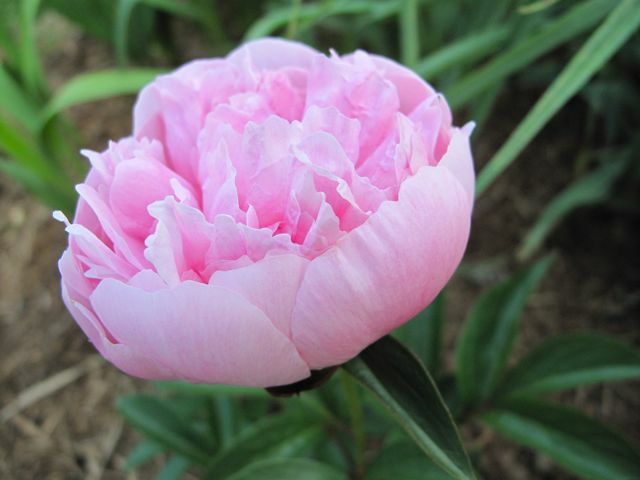 An exciting highlight is the single bloom on the peony recently added to the garden, Paeonia ‘Pink Parfait.’ Although its planting tag indicated a June bloom, it was ready yesterday without regard to the calendar, as was the gardener. As the focus transitions away from roses and irises there are many required tasks this week that will help keep the garden looking nice. 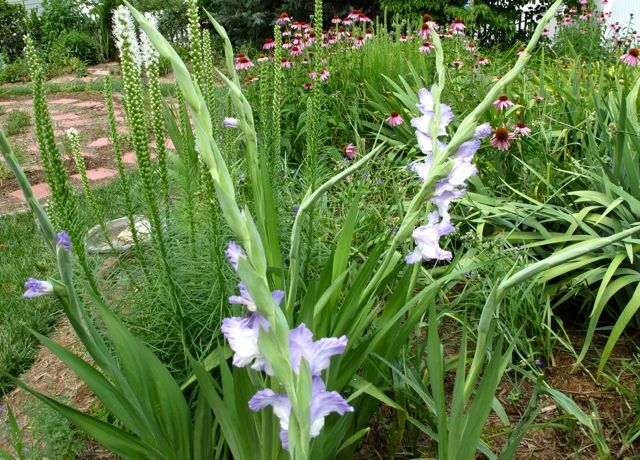 The faded iris blooms and the bloom stalks need to trimmed back to tidy up, although the leaves need to remain for several months before being trimmed back to 6 inches in a fan shape. Is this the year the irises will finally get divided? The southern path is full of white rose campion, but none of the favored magenta-hued rose campion survived the winter. 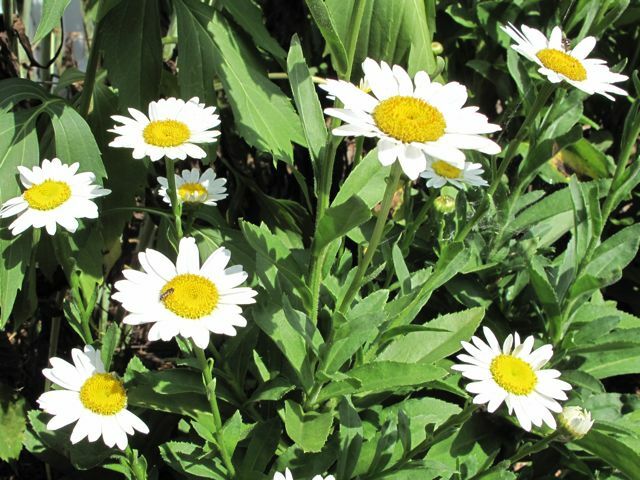 Deadheading is a must if they are to continue to look attractive and to keep them from self-sowing so heavily. The many Eastern Red Columbine is done for this year and needs to be cut back severely; it will maintain a nice green mound all summer. Tradescantia is pretty now but needs to be thinned, as it has spread too widely. Many were sheared heavily ten days ago. 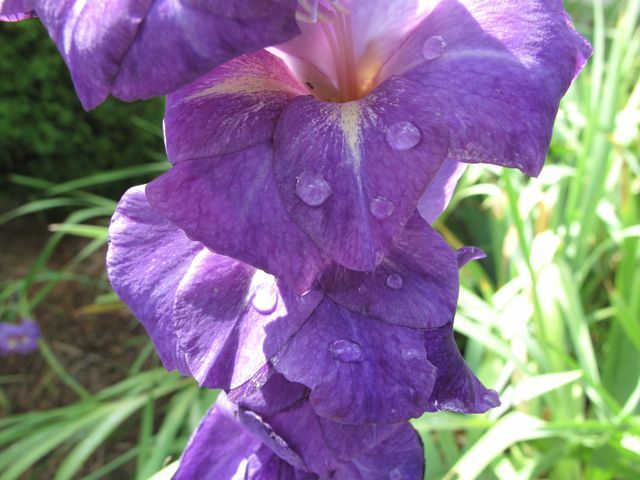 The daylilies, the sweet peas–all overgrown. The spirea finished its bloom weeks ago and should be pruned back hard to maintain its size. Other chores abound. The fence installation was completed last week and paths to the gates need to be improved. 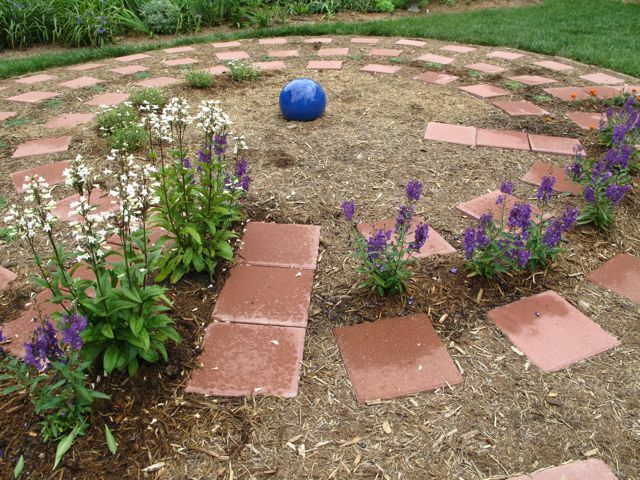 How to finish planting the meditation circle is still an interesting problem to solve, something to ponder while working on these maintenance tasks this week and contemplating transitions. 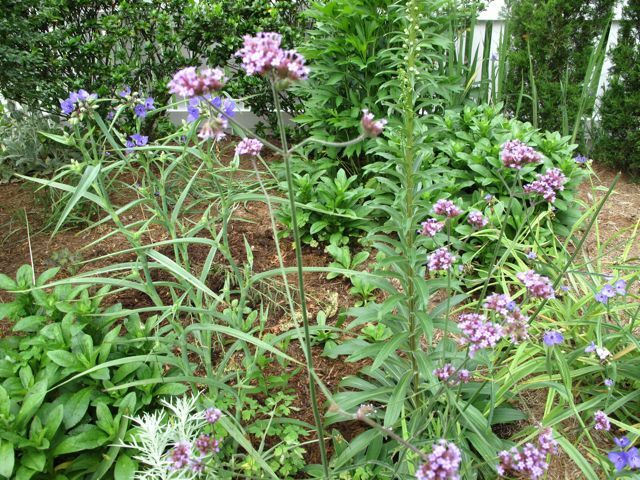 This entry was posted in garden and tagged artemisia, daffodil, echinacea, foxglove, Hellebore, iris, lavender, Lenten Rose, meditation garden, meditation path, monarda, Paeonia 'Pink Parfait', penstemon, peony, rose campion, rudbeckia hirta, spiderwort, spirea, tradescantia, verbena bonariensis, yarrow on May 12, 2011 by pbmgarden. Rain. Rain. I stop short of asking this week’s soaking rains to go away, come again another day. Here in central North Carolina, severe drought-stricken as we are, it would be imprudent to wish away the relief of water falling from the sky, but I do admit to a tiny bit of impatient foot tapping. This week has been mostly a wash-out for making my meditation garden a reality. Chopping and removing grass from the 20-foot diameter circle are on hold. Subfreezing lows earlier in the week brought sleet just a few miles up the road, but in this garden the unusually cold temperatures have not been the issue. The impediment to achieving progress lately has been the rain: thunderstorms yesterday morning, more rain expected today. Tuesday, chilly but sunny, was an exception to a week of soaking rains. Amazingly, that day the soil was dry enough to be able to work it and I set about to methodically chop up the clumps of fescue. Originally I had thought I would leave the grass in the bed, but now have decided to remove and compost it. The work is hard and time-consuming. Assessing the progress achieved Tuesday after three hours of toiling, it is clear the pace is that of the tortoise, not the hare. Yet the process, slow as it is, remains extremely satisfying. I have embraced the idea that developing my meditation garden can be taken as an opportunity and a journey. Eventually the digging will continue and one day the garden will be realized. As with life, itself, it seems more important to notice and enjoy each moment than to simply speed along towards the end. Meanwhile the rest of the garden is responding well to this week’s rains. 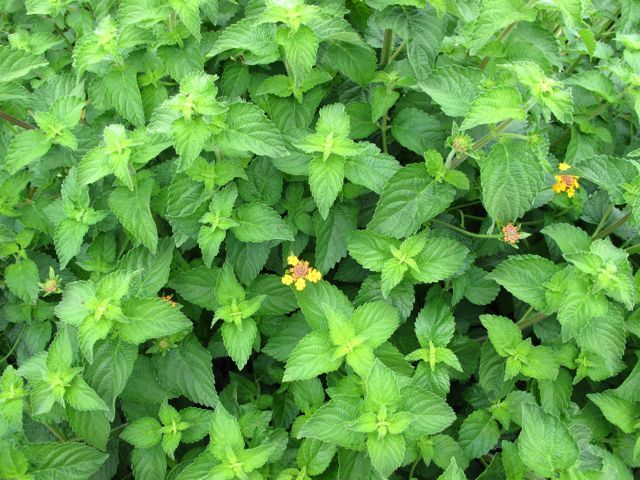 The perennials look fresh and green. The ‘Irish Eyes’ rudbeckia hirta did poorly last summer but seems to be back on track this year. 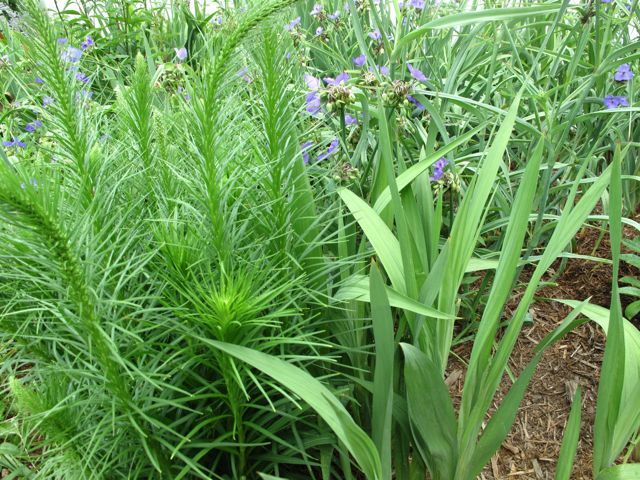 Echinacea (purple coneflower), monarda (bee balm), Rudbeckia hirta (Black-eyed Susan), Lychnis (Rose Campion), Tradescantia (spiderwort) and more are growing enthusiastically. 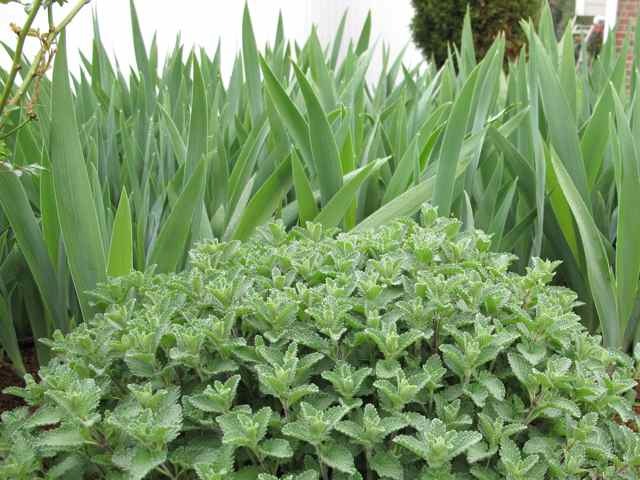 The nepeta (catmint or catnip) has formed a strong, but gentle mound in front of tall drifts of irises. 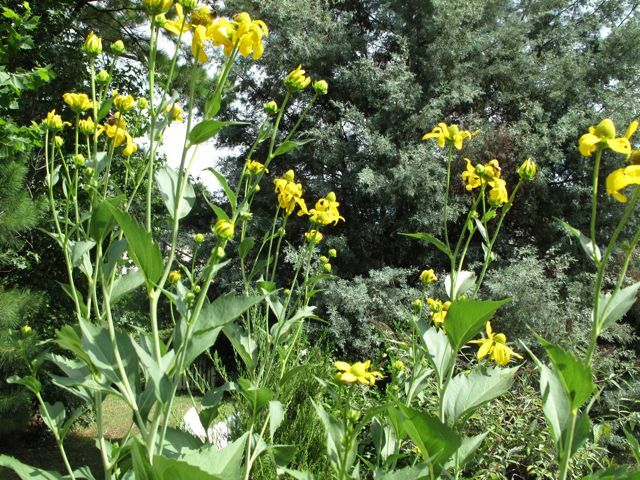 This entry was posted in garden, pbmgarden renovation and tagged almanac, catnip, iris, meditation garden, meditation path, nepeta, rudbeckia hirta on March 31, 2011 by pbmgarden.